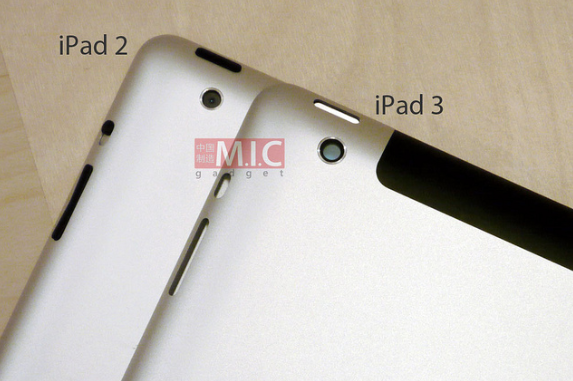 In a roundup of iPad 3 rumors, MICGadget included photographs of a purported iPad 3 shell. The shell is shown in comparison to an iPad 2 back shell. Notable differences include a 1 mm to 1.5-mm thicker design, depending on where on the iPad 3 you are measuring. In addition, more tapering is shown. This will likely make the iPad 3 feel thinner than the iPad 2 when being held. While not visible in the images, the report claimed the iPad 3 bezel is slightly narrower than the iPad 2’s bezel. MIC’s sources also pointed to the iPad 3 having a larger camera lens. This would mean the iPad 3 has an improved camera, but MIC is uncertain of the quality. It also included some bits such as 16GB, 32GB, and 128GB iPad 3 capacities in addition to claims of a 7-inch iPad launch later this year. We would not put too much trust into the iPad mini claim, because these smaller-iPad rumors typically come and go with no success.